Hello Linux Geeksters. As you may know, Xtreme Download Manager (XDMAN) is a java based download manager, with interesting features, like: the possibility to increase the download speed up to 500%, has pause and resume features, schedule downloads, has support for supports HTTP, HTTPS and FTP protocols, firewalls and integrates well with the popular internet browsers. The latest version available is Xtreme Download Manager (XDMAN) 4.7, which has been recently released. 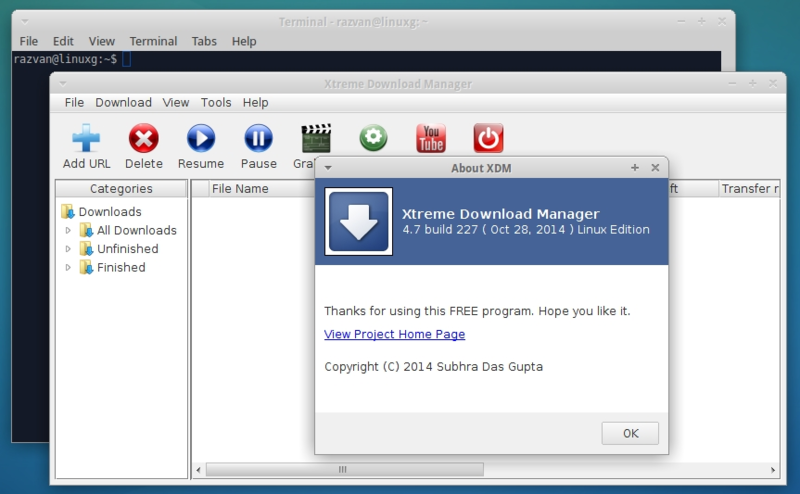 In this article I will show you how to install Xtreme Download Manager (XDMAN) 4.7 on Ubuntu 14.10 Utopic Unicorn, Ubuntu 14.04 Trusty Tahr, Ubuntu 12.04 Precise Pangolin, Linux Mint 17.1 Rebecca, Linux Mint 17 Qiana, Linux Mint 13 Maya, Pinguy OS 14.04, Elementary OS 0.3 Freya, Elementary OS 0.2 Luna, Deepin 2014, Peppermint Five, LXLE 14.04, Linux Lite 2.0 and other Ubuntu derivative systems.